All information related to the GTC Garm is non-canon. The GTHC Garm is the next-generation cruiser in the Fenris line that has served the alliance so well. 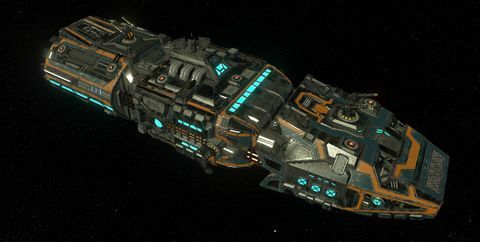 The Garm is a heavy cruiser, carrying almost as much firepower as a Deimos, but with greater speed and maneuverability. Boasting 18 laser cannons, 3 Tactical Missile Launchers and 2 Beam Cannons, the Garm was redesigned around the idea that a good defense is a good offense. This page was last edited on 18 December 2018, at 03:47.